Almost two out of three private businesses that hire low-wage workers gave them a pay rise last year, the highest proportion in five years, according to a Manpower Ministry report released yesterday. In 2013, almost four out of five, or 77 per cent, of such establishments did so. The ministry said, when contacted, that the wage increases last year benefited 68 per cent of all low-wage employees who had worked for at least one year. The proportion of beneficiaries among all outsourced low-wage employees was higher, at 71 per cent, the ministry said. But the proportion of private establishments that raised the pay of their outsourced low-wage workers dropped to 55 per cent last year compared with 61 per cent in 2016, the report said. Low-wage workers typically earn up to $1,200 a month. The wage practice report said that of the 62 per cent of businesses that raised the basic pay of these workers last year, nearly half gave at least $45 more each month. 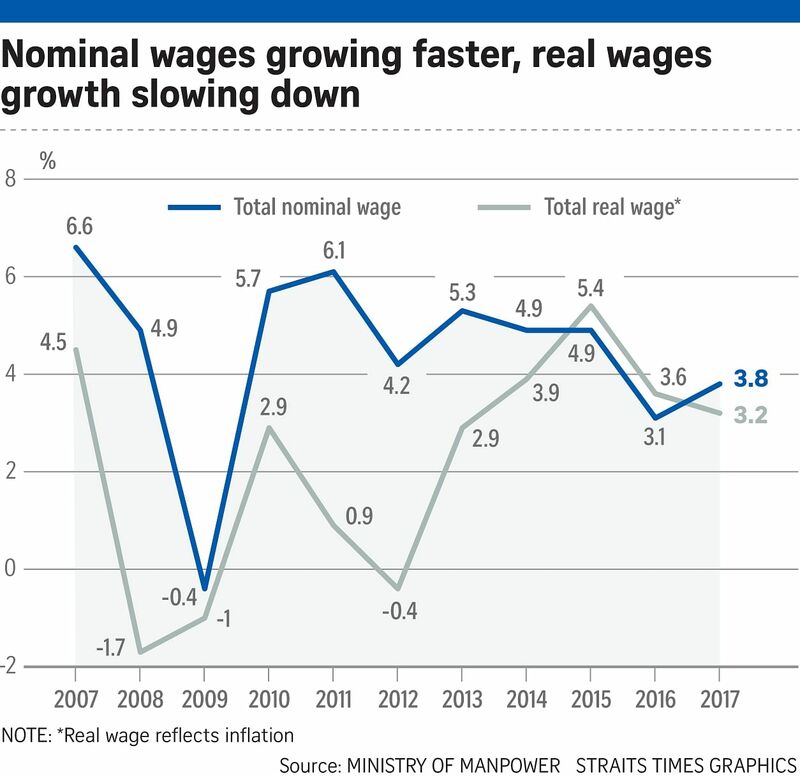 This is in line with the guidelines of the National Wages Council (NWC), which recommended last year that companies give a built-in rise in monthly pay of $45 to $60. The proportion of companies - 48 per cent - that adopted the council's recommendation last year was more than double that of the previous year, which was 21 per cent. As for not giving a pay rise, the top reasons cited by employers were: poor business (16 per cent) and that they already pay the market rate (15 per cent). Fewer companies, however, adopted the NWC recommendations for outsourced workers, and their reasons included contractual agreements (16 per cent) and that they felt they were adhering to the market rate (16 per cent). The report also found that the average basic nominal pay rise for low-wage employees was 8.9 per cent, while that for outsourced workers was 7.5 per cent. Among these workers, those in the wholesale and retail trade industry saw the biggest increase, 10.5 per cent. Next were those in accommodation and food services, transport and storage as well as services: The increases were between 9 per cent and 9.6 per cent. The lowest increase was in the administrative and support services industry: 7.6 per cent. Labour MP Zainal Sapari, who is assistant secretary-general of NTUC, suggested making it mandatory to pay these workers a 13th-month bonus. He also wants the Progressive Wage Model to include more industries, apart from the cleaning, security and landscaping sectors. The model specifies starting wages for workers according to their skill and experience levels, so workers can get higher pay as they upgrade their skills. "We have to do something different to prop up the salaries of our low-wage workers," he said. Madam Salehah Abdullah, 68, who has been a tea lady at Cleaning Express for 11 years, said her pay has risen in the last three years. "But the cost of things will go up. I pray my pay will keep going up too," she said, adding that she provides for her sick husband as well.